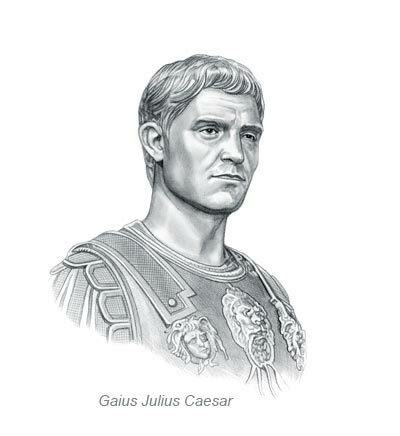 The following list contains the names, dynasties and historic eras of all the Roman Emperors. The content of this article provides interesting history, facts and information about the rulers of Ancient Rome and the Roman Empire including a full Dynasties of all of the Roman Emperors. The Julian-Claudian Dynasty 27 BC to AD 68. This dynasty is known as the Julio-Claudians because its Emperors belonged to the patrician families called the Julii and the Claudii. Some of the most famous of all of the emperors belonged to this dynasty including the first Roman Emperor, Augustus Caesar who was followed by Tiberius, Caligula, Claudius and Nero. The Year of the Four Emperors 68 - 69 AD and the beginning of the Flavian Dynasty. Following the suicide of Nero there was a brief period of civil war in Rome which resulted in the Year of the Four Emperors which saw the successive rise and fall of Galba, Otho and Vitellius until the final accession of Vespasian who became the first ruler of the Flavian Dynasty. The Severan dynasty (193 - 235). Septimius Severus began the Severan Dynasty which included Septimius Severus, Caracalla, Geta, Macrinus, Diadumenian (son of Macrinus), Elagabalus and Alexander Severus. The Severan Dynasty marked the end of Pax Romana (Roman peace) and ended the practice of choosing heirs based on ability rather than lineage or civil war. The "Barracks Emperors" (238 - 268) who were all military generals who seized power by force. Taxation was high, the economy was failing and Roman territories were being captured by barbarians and the Roman government was unstable. The people of Rome were in despair. The decline of Rome seemed almost inevitable. During this terrible period in Roman history there were nineteen usurpers, or pretenders, to the throne but this period is usually known as that of the 'Thirty Tyrants'. During this uncertain era and violent environment the promise of an afterlife seemed to be the only thing to hope for. And people started to turn towards a new religion, Christianity. The Gallic Emperors (260 - 273). The Gallic Empire is the name given to the independent realm that existed for a brief period during the Crisis of the Third Century. The Gallic Empire consisted of the breakaway Roman provinces of Germany, Gaul, Britannia, Spain and Portugal. Finally the emperor Aurelian sought to reunite all the empire and marched against the Gallic empire. Aurelian fought against the last of the Gallic emperors. He was victorious and Tetricus and his son surrendered and the Gallic territories were restored to the empire. In 285 the Roman Empire was split in half by Diocletian - The Western Roman Empire and the other half became known as the Eastern Roman Empire or the Byzantine Empire. The Valentinian dynasty (364 - 394) derives its name from the first of the dynasty's Emperors - Valentinian I. Orthodox Christianity became the officially tolerated variant of the faith and the Empire became irrevocably split into two halves. The Western Empire (394 - 476) The Western Roman Empire ended officially with the abdication of Romulus Augustus on 4 September 476. Historically, his reign has been used to mark the fall of Rome, the Decline or Fall of the Roman Empire and the onset of the Dark Ages. During this period the city of Rome was sacked by the Visigoths in 410 and by the Vandals in 455 signalling the disintegration of Roman authority and the Fall of the Roman Empire. This is where the Dynasties of Roman Emperors ends. The Empire was to live on in the east for many centuries although it was significantly reduced in size. It became an essentially regional power which was centered on Greece and Anatolia. This medieval stage of the Roman Empire is referred to as the Byzantine Empire. The content of this Dynasties of Roman Emperors category provides free educational details, facts and information for reference and research for schools, colleges and homework. Refer to the Colosseum Sitemap for a comprehensive search on interesting different categories containing the history, facts and information about Ancient Rome.